Things are not looking too hot for the HP TouchPad right now as apparently not even the recent price cuts are helping retailers move more units off store shelves. According to a report on AllThingsD, Best Buy has sold just 25,000 units -- less than 10 percent of its inventory -- and with surplus stock of over 200,000 the company is now asking HP to take back the unsold tablets. HP is reportedly pleading with Best Buy to be patient and is sending a senior executive over to Minneapolis soon to meet Best Buy executives. That could mean we'll see further discounts in the coming weeks or perhaps some bundle deals with HP laptops as the back-to-school buying season revs up. Analyst Rich Doherty of the Envisioneering Group says sales are also poor at Walmart, Microcenter and Fry's. The report comes just hours ahead of HP's quarterly earnings call today, where many expect the company to keep TouchPad numbers under wraps, or if they do share some figures it will probably reflect "channel sales" (the number of tablets shipped to retailers) rather than actual "sell through" numbers. HP's first foray into tablets has seen a lukewarm reception, with initial reviews pointing to the TouchPad's slow responsiveness and limited app catalog. WebOS is the key piece of the HP's $1.2 billion acquisition of Palm last year and is supposed to be a big part HP's future -- with plans to put it on everything from laptops to printers. The software itself, while noticeable buggy, does show promise, but HP dropped the ball on the hardware side -- much like Palm did with the original Pre. 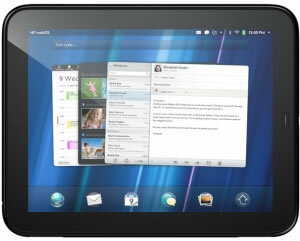 Now the company is being forced to take some drastic measures to get WebOS and its TouchPad tablet off the ground. Earlier this month, HP already announced a $100 discount on the TouchPad, bringing the price down to $400 for the 16GB version and $500 for the 32GB version.